India is one of the three largest markets in the world for Internet and smartphone growth, according to former analyst Mary Meeker, whose annual Internet Trends report is considered the gospel for tech developments around the world. So it should come as little surprise that employees on the subcontinent are increasingly using their smartphones and other connected personal devices to do their jobs. The invasion of personal mobile devices in the workplace has become one of the most significant trends to challenge network administrators in quite some time. In fact, Gartner says that by 2017, 20 percent of India’s white-collar workforce will access enterprise data (beyond email and calendar) on personal devices. Add in the need to contend with the network implications of cloud computing, Big Data and data center expansions, and network administrators certainly have their hands full. As this activity picks up steam, administrators are continually recalibrating and evolving their networks to keep pace. Along the way, they’ve turned to several new technologies and standards for maximizing network capacity, security and flexibility. Here are the Top Five Networking Trends that are reshaping the enterprise in India. 802.11ac (also known as 5G WiFi) is known for enabling super-fast streaming of over-the-top content throughout the home. That’s absolutely true, but it’s also proving useful in corporate environments. The latest 802.11ac chips, based on the IEEE standard, are three times faster and up to six times more power efficient than equivalent 802.11n solutions. This means faster throughput for work-related activities such as streaming content, video conferencing and access to the cloud. It also means higher capacity to support more wireless users, as well as broader coverage throughout corporate facilities (fewer dead spots enabled by beamforming). So it’s little wonder that 802.11ac is taking off in the enterprise, with 5G WiFi access points nearly doubling every quarter, according to Infonetics. Of course, this has put added pressure on network administrators to better manage and secure their network connection points. 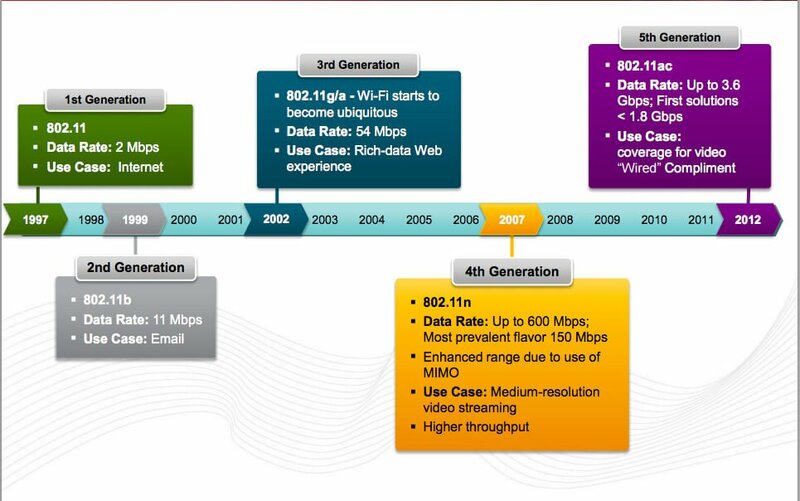 Figure 1: Evolution of Wi-Fi showing the technology’s 15-year history and exponential gains in throughput, now reaching 3.6 Gbps with 802.11ac (5G). A 10-fold increase in 802.11ac access-point sales has put enormous pressure on the enterprise. 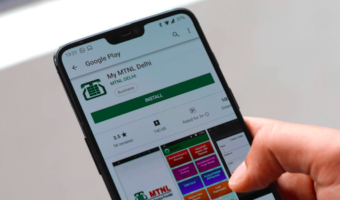 Whether they realize it or not, many office workers in India have been enjoying the benefits of 5G WiFi connectivity for some time, both on their smartphones and home network routers. These devices, which industry watchers call “Wave 1,” already line store shelves. This year, IT 802.11ac is expanding to a second tier (Wave 2) of products and finding its way into the enterprise, enabling greater wireless range and performance throughout the workplace. As this new set of products rolls out, traffic rates through access points are likely to surpass multiple gigabits per second, requiring both the access point and the Ethernet switch ports to scale beyond 1000 BASE-T (1G). Most companies pushing up against the limits of Gigabit speeds are ready to upgrade, but their choices have been limited. 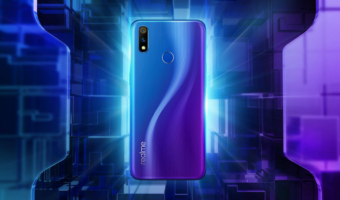 The options were to either jump up to 10 Gbps Ethernet, the next available IEEE standard, or add a second 1 Gbps connection to double the bandwidth. Fortunately, the Wave 2 addendum to the original 802.11ac wireless specification offers another alternative. In the near future, Wave 2 offerings are expected to support the use of newer 2.5 Gbps Ethernet wired networks or even 5 Gbps uplinks. Either way, achieving maximum bandwidth will mean the enterprise wiring closet absolutely must support both existing 2G and 5G technologies. In today’s data center, finding the most cost efficient way to move information about is one of the highest priorities. Operators must balance the need to optimize performance with the requirement to maintain the lowest possible capital and operating costs wherever possible. The answer for achieving both seems to be mixing and matching network speeds. Experts predict that the largest cloud operators are most likely to embrace 100G Ethernet fabrics, but more cost efficient 25G and 50G will still serve as the workhorses for most data centers. In fact, a recently formed industry group, the 25 Gigabit Ethernet Consortium is promoting 25G and 50G as the best options for faster and more cost-effective connectivity between the server Network Interface Controller (NIC) and Top-of-the-Rack (TOR) switches in data centers. The 25G/50G standards provide more options for network administrators on top of the already established IEEE 10/40/100G standards. A 25G/50G standard may seem like a step backward, because 40- and 100G Ethernet already exist, but it’s all about the need for more cost-effective speed, specifically from servers in cloud data centers. For example, 25G cabling is about the same cost structure as 10G at 2.5X the performance. Similarly, 50G is half of the cost of 40G with a 25 percent increase in performance. Without a strong network behind it, cloud computing stumbles. The network must scale out to enable applications and data to flow between cloud servers and users. For example, if a server is sitting on a low bandwidth connection, the cloud simply won’t work. That’s why network administrators this year are increasingly looking to replace legacy, tiered, network designs with “cloud-scale” flat network topologies. The new designs are being future-proofed using open, scalable SDN and NFV platforms. The thinking is that very high-density, high-bandwidth, cost- and power-effective switch systems can co-exist alongside expensive, power-intensive and low-port-density systems. 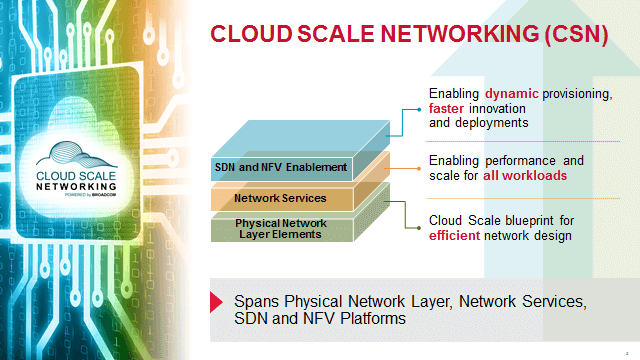 One cloud scale networking architecture that is gaining momentum suggests three layers. At its foundation, sits a physical network layer that includes switches, PHYs, processors and controllers. Next is the network services layer, which provides the capabilities the hardware must have to function on a network. Last is SDN and NFV enablement, which provides the capabilities enabled by having the infrastructure and services in place, such as an open switch ecosystem, NFV and the OpenFlow Data Plane Abstraction (OF-DPA) v1.0 specification. Figure 2: There are three key elements to the cloud-scale networking including, the physical network layer, network services, and SDN and NFV platform enablement. The physical network layer elements provide the blueprint for efficient network design. Cost-effective network services enable performance and scale for all workloads while SDN and NFV enable dynamic provisioning, faster innovation and deployment. For decades companies turned to proprietary combinations of servers, data storage, networking and software to run their operations. With the advent of cloud computing, that’s all changing. Today, customers are demanding systems that can be arranged in different, more heterogeneous ways. They want the flexibility to combine open-source software with off-the-shelf hardware and their own in-house legacy systems. Essentially, they prefer to purchase best-of-breed solutions that will be faster, more cost effective and often times more innovative. In India, open source is becoming more common than in many other developed nations. According to a recent Gartner report, by 2017, about 90 per cent of Indian IT organizations will have open source software (OSS) embedded in their mission critical platforms. And the Indian government has called for the use of open source software across all systems used by the public sector. There is little doubt that India will continue to be at the forefront of adopting the latest networking technologies – because it must. 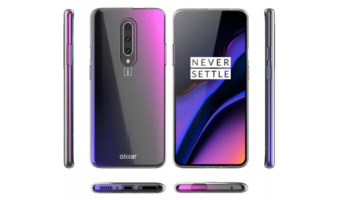 It is one of the world’s most voracious users of mobile and connected devices, and organizations have come to view this technology as integral to operational efficiency and effectiveness. As such, the need to stay abreast of the latest networking trends has never been greater. Rajiv Kapur serves as Broadcom Senior Director of Business Development, India. Reach the author @broadcom.